The Year of W.E.B Du Bois will conclude with three days of symposiums, discussions and cultural events on February 21,22 and 23. In Philadelphia and other cities thousands of people joined in commemorating the 150 anniversary of Du Bois’s birth. We will conclude the year very much in the way we started with a call for peace and the unity of the world’s people against imperialism, neo-colonialism, the ravages of neo-liberal capitalism, poverty and white supremacy. We will highlight this call by celebrating the spirit of revolution enshrined in the legacies of Martin Luther King Jr., Mahatma Gandhi and W.E.B Du Bois. 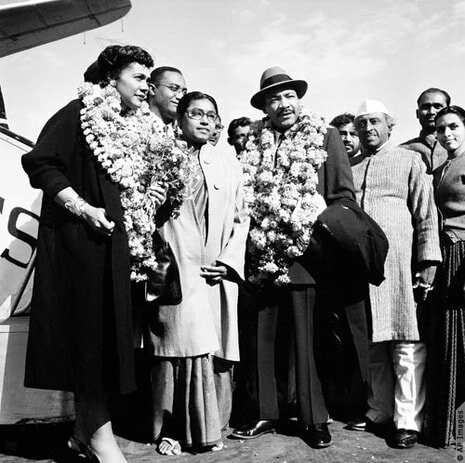 W.E.B Du Bois, Martin Luther King and Mahatma Gandhi after bitter struggles against colonialism and white supremacy concluded that capitalism, as a social and economic system, had outlived its usefulness. Each in his own way called for the socialist remaking of the world’s economy. Each understood that to achieve a new world the struggle for peace was decisive. Ending war and the violence of human societies was the basis for rebuilding human relationships. And that the future of humanity must be based upon the unity of all the world’s people. They thus rejected narrow nationalism, superficial identity politics and moralities that center upon privileging European ideas of truth and progress. The world’s people are erupting in protest and struggle against imperialist hegemony and especially the US Empire. From Venezuela, to Palestine, the Democratic Republic of the Congo and Ivory Coast, from India and China, Iran, Korea and Russia, people are saying No to intervention, war and poverty. They are defending their right to self-determination and democracy. This is no less true for the majority of people of the US. Exhausted from war and austerity, witnessing the gross inequalities of the US society, impoverished by declining wages and tearing up of the social safety net, without adequate health care and education, and with the destruction of democracy at the hands of the billionaire class, the people are crying out for alternatives and real change. The Year of W.E.B Du Bois spoke optimistically to the aspirations of the people; insisting there are alternatives to suffering and hopelessness. We insisted, rather than hopelessness there was reason for hope. This year said to the people of Philadelphia and beyond, unity of the people and struggle, combined with moral integrity and ideological clarity are the way out. We in the Saturday Free School began this project with confidence in and revolutionary love for the people. Our confidence and love was generously responded to by thousands of people. The schools, churches, union halls, libraries and book stores and other institutions of the people welcomed us and made their facilities available to us. The revolutionary spirit lives because Gandhi, King and Du Bois live and are manifest as people come to know and embrace their legacies. They live as long as the spirit of internationalism, the unity of Pan Africa and Pan Asia and intercivilizational unity live. They live as long as their words and deeds are studied and emulated. Fused with activism and protest against gentrification, for the freedom of our beloved Mumia Abu Jamal, for the education of our precious children, for houses for the homeless, food for the hungry and cloths for the ill clothed, we have courageously proclaimed “know the truth and the truth shall make you free”. Upon the mighty shoulders of W.E.B Du Bois we courageously said that truth will sway the future. We struggle with the knowledge, so eloquently expressed by Martin Luther King Jr., that we are all wrapped in a single garment of destiny and what affects one directly affects us all indirectly. The Year of Du Bois has been a year of the truth; at its conclusion we can proudly say of William Edward Burghart Du Bois, His Truth Is Marching On. In the throes of a great and deepening crisis of capitalism and imperialism, like our revolutionary ancestors, we face the moment confident and prepared for the battle. We are strengthened by the knowledge that if we are strong, if we are truthful, if we stand up for moral rightness and truth in the face of lies and if we stand unflinchingly with the people, we will win.